This composition is divided into two separate perspective zones within a framework formed at the sides by the two marble columns. The lower area, where the artist has placed the sleeping guards, has a very low vanishing point. 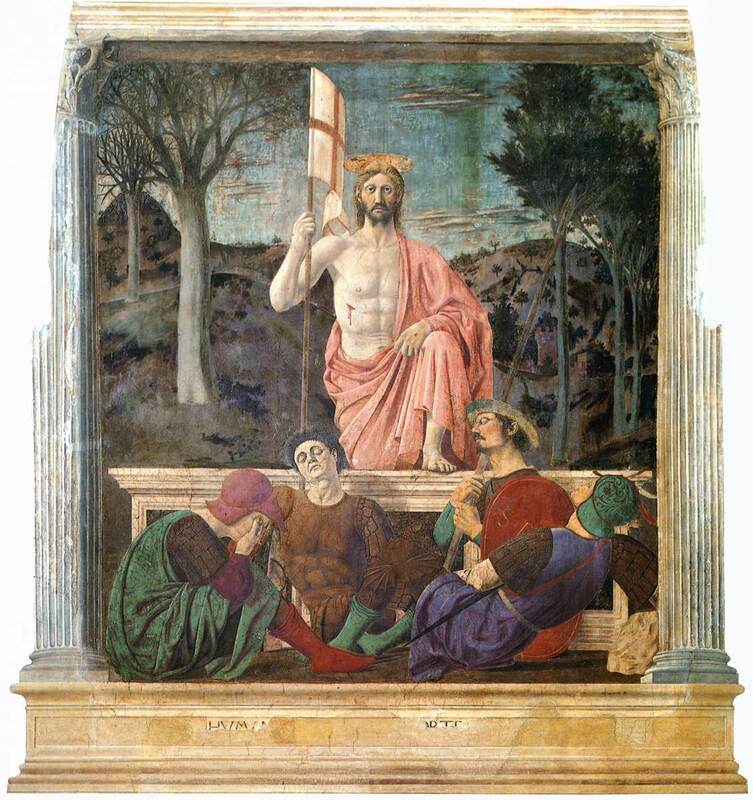 Above the figures of the sleeping sentries, Piero has placed the resurrected Christ, portrayed with a more central vantage point. Christ’s solid peasant features are a perfect representative of Piero's human ideal: concrete, restrained and hieratic as well. The splendid landscape also belongs to the repertory of popular sacred images: Piero has symbolically depicted it as partially immersed in the barrenness of winter. The further the viewer looks to the left, the more the landscape appears bare and hostile, whereas the right half is already brought back to life - resurrected - by springtime. Piero della Francesa (ca. 1415 - 1492) was a Italian painter, who, to his contemporaries was also known as a mathematician and geometer. 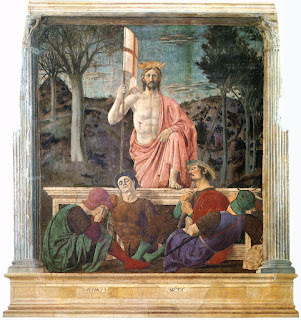 Nowadays Piero della Francesca is chiefly appreciated for his art, which had been virtually forgotten for centuries after his death, but regarded since his rediscovery in the early 20th century as one of the supreme artists of the quattrocento. His painting is characterized by its serene humanism, its use of geometric forms and perspective. According to tradition, and by comparison with the woodcut illustrating Vasari's Lives of the Painters, in this mural the sleeping soldier in brown armor on Christ's right is a self-portrait of Piero.